If you want to lose weight then you need to burn more calories than you consume. For every extra 3,500 calories you burn, you'll lose about a pound of fat. Running is a great calorie burner, but your exact calorie burn will vary based on your weight and the speed that you run at. 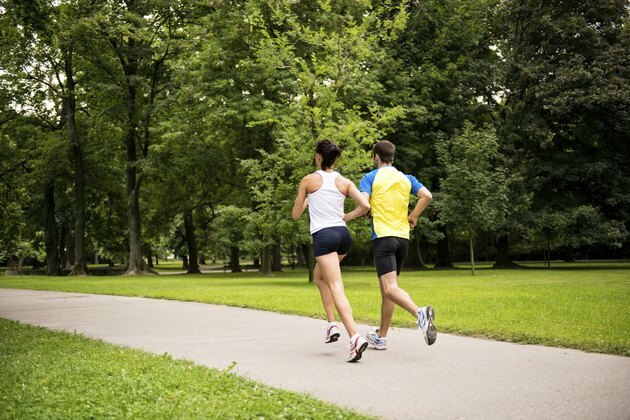 Running at an easy pace of 5 mph a 125-pound person burns about 480 calories per hour or 3,360 calories per week. That works out to almost a pound of fat lost per week. A 185-pound person will burn about 710 calories per hour or 4,970 calories per week at the same speed. For the heavier runner this works out to about 1.4 pounds lost per week. If you can pick up the pace to 6 mph, you'll burn about 600 calories per hour if you weigh 125 pounds -- or 4,200 calories per week. At that rate you can expect to lose about 1.2 pounds per week. For a 185-pound person the calorie loss will be about 888 calories per hour or 6,216 per week. That amounts to about 1.8 pounds lost per week. If you can run at a quick pace of 7.5 mph then you can expect to burn about 750 calories per hour if you weigh 125 pounds -- or about 5,250 calories per week. this works out to weight loss of 1.5 pounds per week. At 185 pounds you will burn around 1,110 calories per hour or 7,770 calories per week. Without changing your diet this would exceed the recommended maximum weight loss of two pounds per week so you would need to increase your calorie intake. You can't ignore your diet just because you're burning calories with your running. You should aim to lose weight at a rate of one to two pounds per week. To do this you need to create a daily calorie deficit of 500 to 1,000 calories. If you don't burn enough calories from running then you need to cut calories from your diet, but if you exceed this range with running you'll have to add calories to your daily intake.